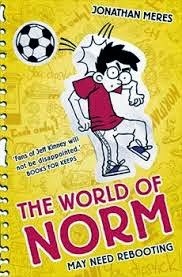 I'm delighted to be hosting a post here today as part of the tour - I recently read World of Norm: May Need Rebooting, and it was great to get the chance to talk to author Jonathan Meres about the latest in his popular series. There's just under a week left of the tour - check out the schedule page for what's left to come!We actually have not one but TWO stops today. For the other one, head over to author Keris Stainton's blog to read her interview with Lisa Glass, whose Blue looks wonderful. I really hope this doesn’t come across as glib or arrogant – and if it does then I apologise profusely and I’m very nice really despite what you might have heard – but I don’t actually have to imagine my readers, as I get to meet so many of them face to face at events. Which is brilliant, obviously. So, what can I tell you about them? Well they’re generally aged from about 8 to 13 and even older than that. And shock, horror – they’re not actually all boys! Far from it in fact. Just as many girls. Which may come as something of a surprise to a lot people who are quick to label Norm as ‘a boy book.’ It absolutely isn’t. It’s ‘a book book.’ And Norm’s a universal character. In my opinion there’s nothing remotely geeky, or nerdy, or dorky, or wimpy about him. He’s a perfectly normal (pun totally intended) nearly 13 year old kid. Who just happens to be a boy. But it could just as easily be The World Of Norma. Which was my mum’s name, by the way, for any psychoanalysts out there. Before Norm was published? The honest answer is I didn’t imagine my readers when I closed my eyes, or any particular age-group. I just wrote what came naturally. And what came naturally, was Norm. Previously I’d written picture books, teen fiction (as it was called, back in the day) and stuff for grown-ups. I guess you could say I’ve found my feet now with Middle Grade. Took flipping long enough! 2. I really liked the way you captured the relationship between Norm and his brothers. Do you have any siblings, and if so, did you argue as much as your characters do when you were growing up? Well first of all, thank you. Second of all, yes I do. I’ve got an older brother. Always have done actually. So I can’t totally relate to Norm, as Norm’s the eldest of three and I’ve always been the baby of the family. I don’t remember arguing a great deal. We got on pretty well on the whole I think. But that was way back in the 20th century, when folk used to leave their front doors open and you could go out with a fiver, go to the pictures, have a meal, buy the latest Jethro Tull album and still have change for the tram home. So in that case, how do I manage to capture the relationship? Easy. I’ve got three sons. I just watch them. It’s not rocket science. 3. Norm falls asleep in school early on in the book, which is one of the main causes of his problems. Did you ever have a cheeky snooze in lessons yourself, or were you a well-behaved pupil? A cheeky snooze at school? Never. College? That was a different matter. Especially if we’d been – ahem – out for lunch beforehand. Which, I must admit did happen rather a lot, because ‘college’ was actually nautical college in Liverpool. I joined the merchant navy straight from school and would spend six months at sea followed by six months ashore. But that’s another story. Sorry, what was the question again? Oh yeah, at school I guess I was pretty well behaved. Didn’t used to get into too many scrapes. No more than anyone else anyway. I may have been a bit too mouthy or cheeky on occasions – and with hindsight I suppose I did like to make my classmates laugh. And teachers come to think of it. But it would be way too simplistic to label me as ‘The Class Joker.’ Sometimes I was and sometimes I wasn’t. I’m a seething cauldron of contradictions, me. Actually no I’m not. I’m just trying to make myself sound far more interesting than I actually am. 4. His other main problem is that his bike gets stolen. I feel his pain at losing a treasured possession - my phone broke 2 days ago and I'm struggling massively without it! What's the one object you'd be lost without? Well, I’d be pretty lost without a cafetiere, or any other means of making a decent cup of coffee. And I don’t care how middle class that makes me sound. Decent coffee is a fundamental human right – schools please note. Especially schools who are thinking of getting in touch with me to do an event. If you’ve got one of those industrial sized tins of a certain brand of ‘mellow’ instant coffee taking up half the staff room? Forget it. Find yourself another author. Apart from that? I’d be pretty lost without any means of listening to music. And my guitar. And my flute. And my personally signed George Best book (along with the rest of the European Cup winning Man United team of 1968). Oh and my reading glasses. I’d be well stuffed without them. 5. Norm's language is - as I'm sure the boy himself would say - flipping funny! Do you have any tips for writing great dialogue? Again, thank you very much. I do enjoy writing the dialogue. It’s all the other stuff I sometimes find a bit of a chore. Well, maybe not a chore. But a bit more problematic let’s say. It’s almost a relief when I get to some dialogue. It comes very naturally to me. And I think writing naturally is probably the key. Just listen to how other people speak. Real people. Not people on the telly or the radio. I can’t bear listening to screamingly middle class dramas or so-called comedies on the radio where people sit around pretending to clink their crockery and talking absolute guff. My tips? Well when it comes to writing dialogue either spoken by children – or intended to be read by children, I’d say go easy on the vernacular and the slang. Not only will it date very quickly (see ‘Yo! Diary!’ by Jonathan Meres, ‘Yo! Diary! - And Another Thing’ by Jonathan Meres and ‘Yo! Dot Uk!’ also by Jonathan Meres) but there’s nothing worse than a grown-up desperately trying to be ‘down with the kids.’ They’ll smell it a mile off. Innit? 6. You were a stand-up comic before becoming an author - what are your best and worst memories as a comic? A huge number of best memories. Amazing gigs with all kinds of amazing people at all kinds of amazing little venues. At the other extreme, being almost knocked off my feet by waves of laughter generated by three and a half thousand people at the Edinburgh Playhouse. Performing in London’s glittering West End. Getting nominated for The Perrier Award. (Note nominated by the way. That’s me. Always the bridesmaid.) But to this day, getting boiled sweets lobbed at me by several hundred irate Bros fans at the Hammersmith Palais remains a career highlight. Worst memories? Well I still cringe whenever I recall truly dying on my backside for the first time. Couldn’t face walking back out through the audience afterwards. Just horrendous. And with hindsight I don’t suppose it was a great decision turning down the opportunity to be on Saturday Night Live. I thought that if I did it, I’d somehow be ‘selling out’ or something? I know. What an idiot. But hey, that’s showbiz. 7. Norm is rather unimpressed when he's headhunted to play for a football team in this book, as he'd much rather be on his bike. Rumour has it you have a secret ambition to play for Nottingham Forest? Is this true, and would you go for winning the FA Cup with Forest, or for winning a major mountain biking competition? Oh it’s absolutely true. I would have loved to have played for Forest. I still have occasional dreams where I am doing. Or rather, I’m about to. But I can’t put my boots on, or find my way out of the dressing room or something. And then all my teeth fall out and when I wake up there’s a damp patch on the mattress. Actually that last bit’s not true. But I was captain of my school team. Oh, all right then, my primary school team. But given that I went to a really tiny village school that could barely scrape a team together without enlisting a couple of dinner ladies, that wasn’t nearly as impressive as it sounds. FA Cup winner’s medal or mountain biking medal? No contest. And besides, I’ve actually forgotten how to ride a bike. 8. You also have a past which involves appearing in numerous pop videos - if you could get a band to record a theme song for World of Norm, who would you pick? Yes, that’s also true. Erasure? Strawberry Switchblade? Nik Kershaw? And they’re some of the cooler ones! Actually probably the coolest one I was in was ‘Rise’ by Public Image Ltd. Which was great because I kind of missed out on punk as I was at sea at the time, but at least I can say I’ve had a light ale with John Lydon in a trailer behind King’s Cross station. A theme song for Norm? Well, being a complete and utter megalomaniac I’d probably insist on doing it myself. But failing that? Blimey, that’s very difficult. It’s a toss-up between XTC, Queens of the Stone Age or Outkast. No, wait a minute,I’ve got it. Lindisfarne, featuring Pharrell. 9. What are you reading at the moment, and would you recommend it? The Hunger Games. And please nobody tell me whether Jennifer Lawrence dies in the end. I’m guessing probably not, because there’s at least another two films to come. Would I recommend it to the handful of people who haven’t already read it? Absolutely. Thoroughly enjoying it, although to be honest it’s not my ‘normal kind of thing.’ All those kids running round in dystopian hoodies and that? But then I’m not sure exactly what ‘my normal thing’ actually is. When it comes to books – and music for that matter – I have a ridiculously wide taste. Which is one reason why I’m really rubbish at answering questions beginning ‘What’s your favourite…..’ The other reason is I’m incredibly indecisive. I don’t actually read a huge number of children’s book. And I never read any of the ones liable to be sharing shelf/table space with Norm in well-known high street booksellers. And won’t until I know for certain that I’ve written the last ever Norm. That way I can’t ever be subconsciously – or even consciously influenced by them. And I certainly can’t ever be accused of ripping them off. 10. What's the last thing you Googled? You mean apart from myself? That would be ‘How financially viable is it to sell old rope?’ Oh and how to spell ‘Megalomaniac’? 11. 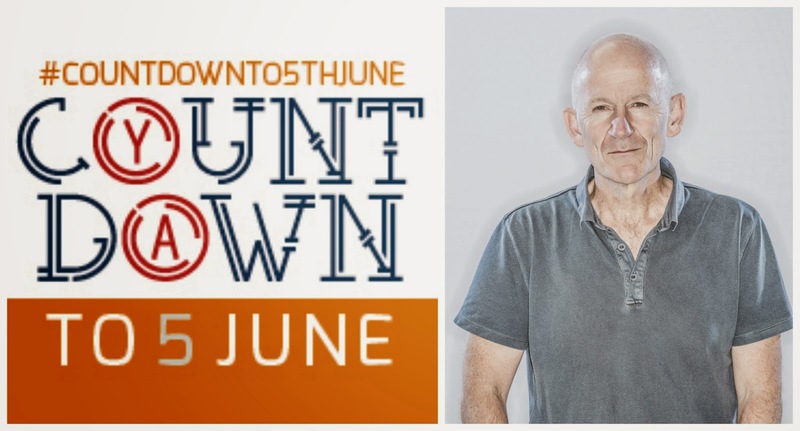 What's next for Jonathan Meres? In the short term? Something like 25 events/sessions in June to promote May Need Rebooting. (It’s all about shifting units folks.) Slightly longer term? A Norm activity book, called May Need Filling In comes out in September, followed by Norm 7 aka Must Be Washed Separately, in October. And I’m currently playing around with possible story lines (and titles) for Norm 8. I’m not going to lie. There’s a part of me that’s desperate to write something completely different and non-Norm-related again. And I will one of these days. But there just isn’t time at the moment. Admittedly, as problems go, that’s a pretty nice problem. Fab interview - thanks, Jonathan!